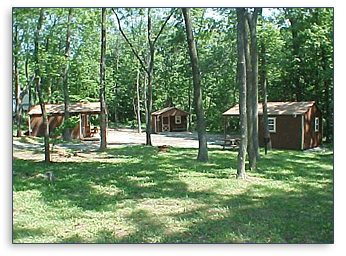 With 100 spacious and shaded full hook-up sites, along with tent sites and cabins, Dogwood Acres has you covered. Whether your family brings a tent, pop-up camper, trailer or motorhome, we’ve got the perfect site. 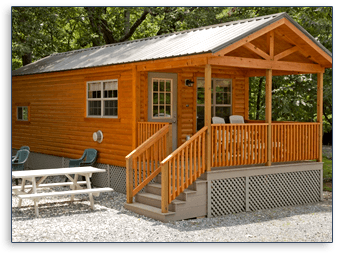 If you are new to camping, you can rent one of our three styles of cabins to enjoy a family camping vacation experience that is sure to last a lifetime. Two night minimums on all weekend reservations (three night minimum for holidays or event weekends). All rates are based upon a family of 5 (2 adults and 3 children). Extra adults: $5.00 day pass / $7.00 overnight / $10.00 holiday. Extra children (4-15 years of age): $3.00 day pass / $5.00 overnight / $7.00 holiday. Maximum of 8 persons per site, that which includes your party and guests. Children 3 and under: Free day pass or overnight. 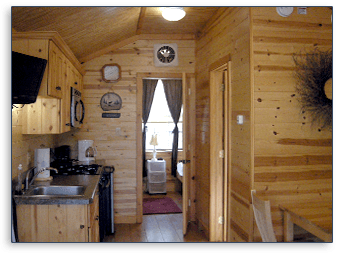 All rental cabins or rental trailers check out by noon. Early check-in (before 11:00AM) will be charged 1/2 day rate, if site is available. Please call ahead. Checking in between 11:00AM and 2:00PM, add $5.00 extra per hour. Please call ahead to see if site is available. Late check-outs must notify office, subject to site availability. Late check-out until 4:00PM is $5.00 per hour based on site availability. After 4:00PM you will be charged a full day. This beautiful log-sided cabin is just like home! 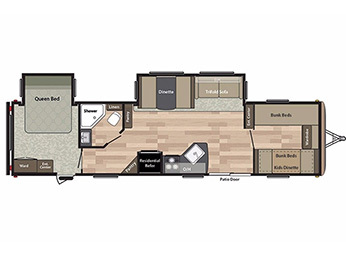 Features one bedroom with a full bed and 3 twin beds set up as bunks. Sleeps 2 adults and 4 children or a maximum of 4 adults. A full kitchen includes refrigerator, sink, gas stove with oven, Includes dishes, pots & pans, toaster, coffee pot/w filter, utensils, paper towels, toilet paper, dish soap and hand soap. No hair dryer. Picnic table outside, with fire ring, gas BBQ. No smoking in rental cabin. Smoking may result in forfeit of security deposit and being asked to leave. No pets. Linens, pillows and towels are not provided. Security deposit required. 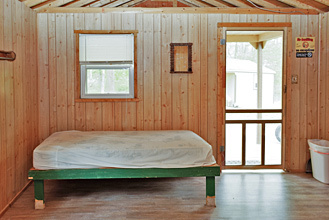 Features 1 rustic queen bed and set of twin bunks. 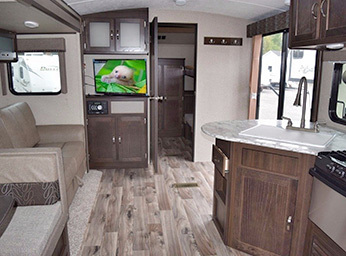 Handicapped accessible toilet and sink, air conditioner, TV with cable, college-style refrigerator, microwave oven, and coffee maker. Paneled walls, tiled floors, screened and solid front doors, window with screens, overhead ceiling fan and light, picnic table on porch, gas BBQ, and fire ring. Linens, pillows and towels are not provided. No cooking indoors. Security deposit required. No smoking in cabins. Smoking may result in forfeit of security deposit and being asked to leave. No pets. Sleeps 2 adults and 3 children or a maximum of 3 adults. Feature 1 full size bed and 2 singles. Paneled walls, tiled floors, screened and solid front doors, window with screens, overhead ceiling fan and light, picnic table on porch, standing charcoal BBQ, and fire ring. Linens, pillows and towels are not provided. No cooking indoors. Pets permitted at $10.00 per day, per pet. Security deposit required. Maximum of 2 dogs per site. No heat. If a heater is needed, please inform us ($5.00 daily charge). No smoking in cabins. Smoking may result in forfeit of security deposit and being asked to leave. Picnic table outside, with fire ring. 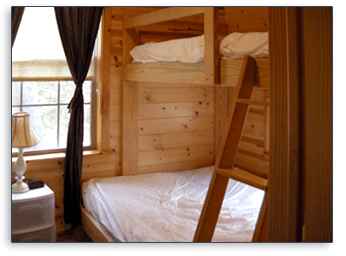 Queen bed, full bed in sofa, bunk house with 2 twin bunks, also footon type mattress on floor. No pets. Security deposit required. Sleeps 5 (maximum 4 adults). Includes dishes, pots & pans, toaster, coffee pot w/filter, utensils, paper towels, toilet paper, dish soap and hand soap. No hair dryer. Picnic table outside, with fire ring, gas BBQ. No smoking in rental trailer. Smoking may result in forfeit of security deposit and being asked to leave. Linens, pillows and towels are not provided. 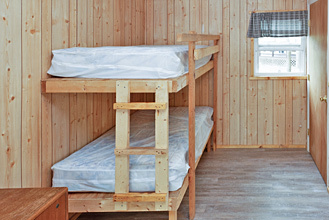 Queen bed, bunk house with 3 single bunk beds. No pets. Security deposit required. Sleeps 5 (maximum 4 adults). Includes dishes, pots & pans, toaster, coffee pot/w filter, utensils, paper towels, toilet paper, dish soap and hand soap. No hair dryer. Picnic table outside, with fire ring, gas BBQ. No smoking in rental trailer. Smoking may result in forfeit of security deposit and being asked to leave. Stay 6 nights, get the 7th night free. No other discounts apply. 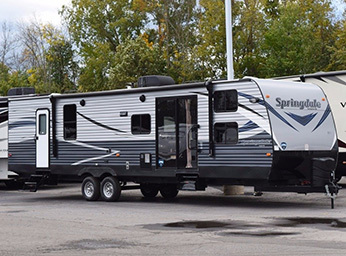 Book back-to-back weekends, leave your trailer on site, save gas and save 10% when booking both weekends. All reservations are paid in full by credit card. No site is reserved without a payment. 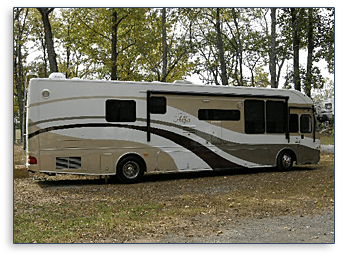 Campsite Cancellations & Refunds: If you cancel a campsite reservation at least 14 days prior to your scheduled date of arrival, a refund will be issued less a $10.00 processing fee. If you cancel a reservation less than 14 days prior to your scheduled date of arrival (up to the day of camping), a rain check will be issued, valid for use within 3 months in the existing camping season. 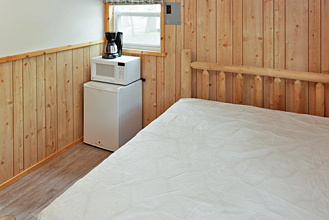 Cabin & Trailer Rental Cancellations & Refunds: Due to the seasonal nature of our business and limited availability of rentals, there will be no cash refunds unless a minimum of 30 days notice is provided. In such cases, a 70% refund will be issued, with a 30% deposit fee forfeited. Cancellations received less than or 30 days prior to scheduled arrival date are non-refundable. No other refunds are given. 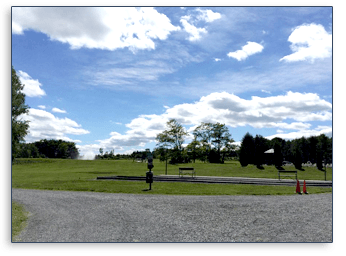 Dogwood Acres Campground wants to make your entire camping experience as carefree as possible. 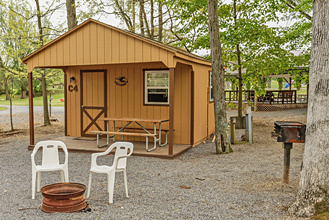 Now you can make your Dogwood Acres reservation requests online … for your choice of campsite, cabin or trailer rental. Simply complete the form below. We will contact you within 48 hours via either e-mail or telephone to confirm availability and to obtain a credit card number to secure your reservation. For your convenience, Visa and MasterCard are accepted. If space is not available, we will contact you via e-mail. If you prefer, you may print this page after completing the form. The completed form may then be mailed with the appropriate deposit. Please complete the entire form before pressing the “Send” button! © Dogwood Acres Campground. All rights reserved.